Everyone knows about at least one part of the honey bee’s anatomy: its stinger. But you’ll get more out of beekeeping if you understand a little bit about the other various body parts that make up the honey bee. Like all insects, the honey bee’s “skeleton” is on the outside. This arrangement is called an exoskeleton. Nearly the entire bee is covered with branched hairs (like the needles on the branch of a spruce tree). A bee can “feel” with these hairs, and the hairs serve the bee well when it comes to pollination, because pollen sticks well to the branched hairs. Eyes: The honey bee’s head includes two large compound eyes that are used for general-distance sight and three small simple eyes, called ocelli, which are used in the poor light conditions within the hive. 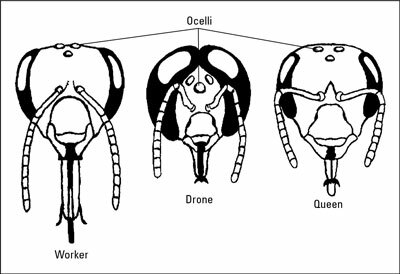 Notice the three simple eyes (ocellus) on the members of all three castes, while the huge wrap-around compound eyes of the drone make him easy to identify. The queen’s eyes, however, are slightly smaller than the worker bee. Antennae: The honey bee has two antennae in front (attached to its forehead). Each antenna has thousands of tiny sensors that detect smell (like a nose does). The bee uses this sense of smell to identify flowers, water, the colony, and maybe even you! They also, like the branched hairs mentioned earlier, detect feel. Mouth parts: The bees’ mandibles (jaws) are used for feeding larvae, collecting pollen, manipulating wax, and carrying things. Proboscis: Everyone’s familiar with those noisemakers that show up at birthday and New Year’s Eve parties. You know, the ones that unroll when you toot them! The bee’s proboscis is much like those party favors only without the “toot.” When the bee is at rest, this organ in retracted. But when the bee is feeding or drinking, it unfolds to form a long tube that the bee uses like a straw. 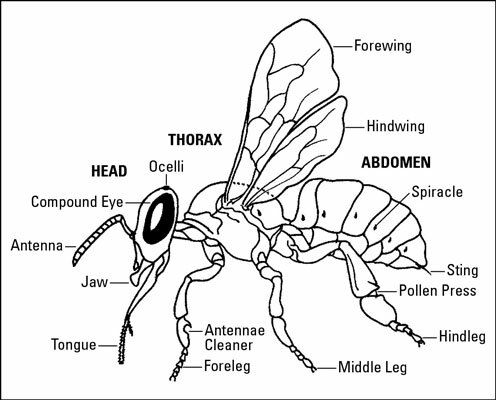 The thorax composes the middle part of the bee. It is the segment between the head and the abdomen where the two pairs of wings and six legs are anchored. Wings: How many wings does a honey bee have? The answer is four. Two pairs are attached fore and aft to the bee’s thorax. The wings are hooked together in flight and separate when the bee is at rest. Legs: The bee’s three pairs of legs are all different. Each leg has six segments that make them quite flexible. The bees also have taste receptors on the tips of their legs. The bee uses its forward-most legs to clean its antennae. The hind legs are specialized on the worker bee. They contain special combs and a pollen press, which are used by the worker bee to brush, collect, pack, and carry pollen and propolis back to the hive. Spiracles: These tiny holes along the sides of a bee’s thorax and abdomen are the means by which a bee breathes. The bee’s trachea (breathing tubes) are attached to these spiracles. It is through the first hole in the thorax that tracheal mites gain access to the trachea. The abdomen is the part of the bee’s body that contains its digestive organs, reproductive organs, wax and scent glands (workers only), and, of course, the infamous stinger (workers and queen only).